-I gave up on my EW subscription last year because I never had time to read it (plus it was weirdly expensive?) but I’ll definitely be picking up the print edition of their romcom issue. 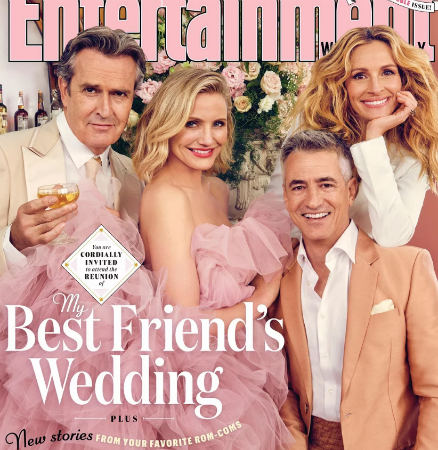 Every article they’ve released from it so far has been great, but the My Best Friend’s Wedding cover seals the deal. I recently rewatched it and it’s even more problematic than I remember (Kimmy’s a child! Julianne’s a monster!) but this oral history is very fun. I really hope this marks the start of Cameron Diaz’s un-retirement cause I missed her. -It’s a big day in covers. Newlyweds Justin Bieber and Hailey Bieber landed on the March issue of Vogue. I hate that he’s not wearing a shirt, but it’s completely expected at this point. They talk about working on their marriage (“We’re coming from a really genuine place. But we’re two young people who are learning as we go”), reflect on his past (“my mom was depressed a lot of my life and my dad has anger issues. Stuff that they passed on that I’m kind of mad they gave me”), and talk about Hailey’s stabilizing influence. -Meanwhile, like many others I will never read about Hailey without thinking of that bit in Caity Weaver’s GQ Bieber profile in which she’s just sitting in his hotel room, doing nothing and waiting for him. –Michelle Rodriguez says Liam Neeson can’t be racist because of how he passionately frenched Viola Davis in Widows. Um, what now? -Hollywood is now developing movies based on Reddit threads. -It looks like Disney+ is shaping up to be a true Netflix competitor, with non-Disney shows streaming, too. –Chris Pratt seems confident that Disney will use James Gunn’s script for Guardians 3. -Scrubs star Sam Lloyd (who played Ted the lawyer) hit his fundraising goal in two days after revealing lung & brain cancer diagnosis. –Seth Meyers got drunk with the Barefoot Contessa. He’s living my dream!! -Ariana is all about clearing up rumours today. She’s denying a feud with Nicki Minaj. –Jennifer Garner talked about being “surrounded by paparazzi” while being married to Ben Affleck. –Gabrielle Union and Jessica Alba have a pillow fight in the LA’s Finest trailer.